140 years of shared history! The story of Camping de La Pascalinette® is closely tied to that of the town of La Londe-les-Maures. It is the story of one of the Var’s oldest and now most-modern campsites, with its water park, multisports ground, gorgeous mobile homes, spacious caravan pitches, exceptional vegetation and magnificent, tree-filled grounds! The campsite’s 13.5 acres are part of the former vast grounds of Château des Bormettes, Château de La Coulerette and Château de La Pascalette, belonging to the family of Victor and Albert Roux, founders and patrons of La Londe-les-Maures in the South of France. In 1904, Albert Roux promised voters to supply the town centre with drinking water from one of his properties. And the elected mayor kept his promise! He installed fountains supplying high-quality water and helped banish the town’s squalor. Albert Roux and his father Victor are considered as patrons of La Londe-les-Maures. Victor’s wealth and the projects implemented by his son helped make La Londe-les-Maures the town it is today. Victor Roux’s eldest son Albert Roux was the 2nd mayor of La Londe. Albert had 2 children with Henriette Poulle: Hélène et Emmanuel. His daughter, Hélène Roux, wedded Charles de Jesse-Levas. Together, they had 4 children: Antoine, Jacques, Elizabeth and Hélène. Their eldest son, Antoine de Jesse-Levas, wedded Germaine Le Cardinal. Together, they had 2 children: Hélène and René. Hélène de Jesse-Levas wedded Hubert Guillaume and founded Camping de La Pascalinette® in 1964. Their second son, Jacques Guillaume, is the current owner and great-great-grandson of Albert Roux, the 2nd mayor of La Londe-les-Maures! Victor Roux was born in Naples and emigrated to France, where he made his fortune in the Marseille area founding and selling businesses. In 1874, he fell under the spell of Château des Bormettes and bought it from the grandson of artist Horace Vernet when he died, together with 740 acres of land stretching from the coast to the pine-laden hills. The Château was located in Les Bormettes, a former property of the town of Hyères, located near L’Argentière (silver mine) beach in La Londe-les-Maures. Against all odds and after much time and lengthy, costly research, Victor Roux threw himself into the silver mining trade, after silver deposits were discovered in the Var. In 1881, he founded and directed the “Société des Mines des Bormettes”. This new industry prompted the rapid development of this rural quarter of Hyères and the town of La Londe-les-Maures was founded in 1901. Albert, the eldest of Victor Roux’s sons, took over from his father as head of the “Société des Mines des Bormettes”. The firm was soon making record profits thanks to the discovery of new silver deposits in La Londe-les-Maures! He wedded the aristocrat Henriette Poule and together they had two children, Paul and Hélène. The Roux family fell in love with this “Coin de Paradis®” (Corner of Paradise) in the South of France over 140 years ago. Formerly part of Hyères, now part of La Londe-les-Maures, Camping de La Pascalinette® celebrated its 50th anniversary in 2014! This magnificent, tree-filled campsite in the Var has seen plenty of changes since 1964: it is now the only campsite in the area (La Londe-les-Maures, Hyères and Le Lavandou) boasting a water park with water games and water slides – plus four heated pools! 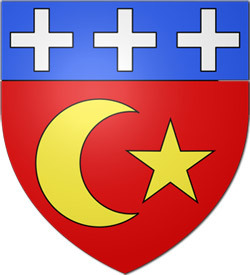 Blason de la ville de la Londe-les-Maures, créé par Albert Roux, entre 1904 et 1912. 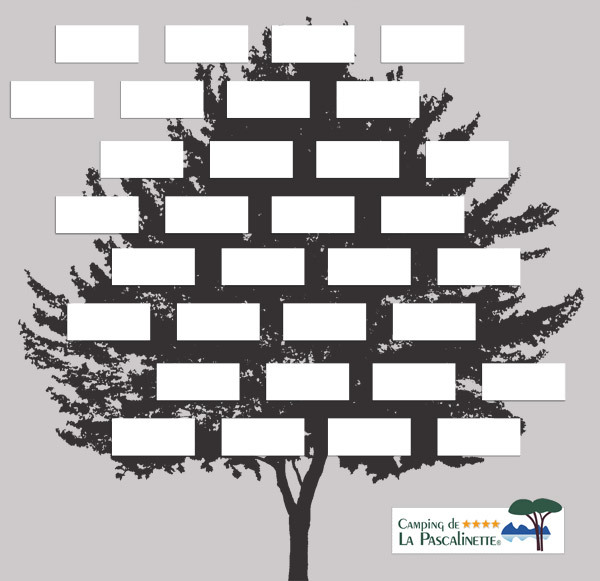 We would like to thank the association ALPHA, authors of the book “La Londe-les-Maures, petites et grandes histoires, Spicilège alphabétique” for helping us write this article.